The First World War is one of historyâs greatest tragedies. 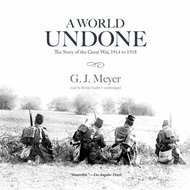 In this remarkable and intimate account, author G. J. Meyer draws on exhaustive research to bring to life the story of how the Great War reduced Europeâs mightiest empires to rubble, killed 20 million people, and cracked the foundations of the world we live in today. World War I is unique in the number of questions about it that remain unsettled. After more than 90 years, scholars remain divided on these questions, and it seems likely that they always will. A World Undone does not claim to have all the answers – if answers are even possible. However, it will provide listeners with enough information to understand why the questions persist, and perhaps in some cases, to arrive at conclusions of their own. A World Undone is a grand, tragic story brilliantly told.